Mexar takes pride in the quality of its products which are developed and manufactured in its UK headquarters. Raw material quality is never compromised and each batch of ink is stringently tested to make sure it meets the Mexar standard. If you are interested in becoming a dealer for Mexar inkjet inks, please contact us for more information. Mexar TEX1 is our flagship product: a high performance aqueous pigment ink for textile printing applications. It combines the highest quality inkjet-grade pigments with Mexar’s proprietary textile binder system to create superior performance in terms of colour gamut, printability and fastness properties. Mexar TEX1 is available in a wide range of colours: cyan, magenta, yellow, black, blue, red, green, violet and grey. This enables Mexar TEX1 to produce a large colour gamut suitable for fashion, home décor and other textile printing markets. The inclusion of Mexar’s proprietary binder system within the inks gives end users the best possible flexibility in their production methods. Untreated fabrics can be printed and still achieve high levels of wash fastness. To achieve even higher levels of colour, wash and rub fastness, Mexar have developed a range of pre- and post-treatment formulations that give outstanding results. While other ink companies have removed binders from their textile inks in search of better printing performance, Mexar have invested heavily in the development of inks that expertly balance the properties of colour, printability and fastness required for high-end textile printing markets. Mexar TEX1 is available for a number of different printheads, including Epson (DX4/5/7), Ricoh (Gen4/5), Kyocera (KJ4B), Fujifilm Dimatix (Starfire 1024S/M). DTG (direct-to-garment) inks have been a core product since Mexar's founding. Mexar TEX2 inks have been sold extensively around the world and gained a reputation for their superb wash fastness characteristics in comparison with competitor products. Mexar TEX2 inks provide an outstanding CMYK colour range for DTG printing. The Mexar TEX2 range includes a high quality white ink, designed to run smoothly through DTG printers with no recirculation or agitation required in many cases. 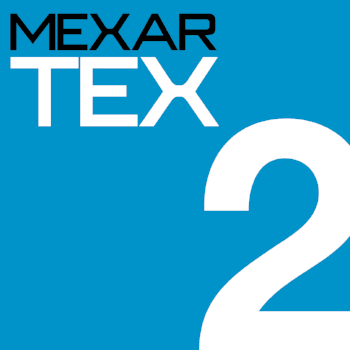 Mexar TEX2 is available for Epson (DX4/5/7) and Ricoh (Gen 4/5) printheads. Mexar also has cleaning solutions and pre-treatments available to work flawlessly with Mexar TEX2 inks. Pre-treatments include a dark shirt pre-treatment, light shirt pre-treatment and polyester pre-treatment. Mexar TEX3 is a high quality reliable dye sublimation ink formulated for wide format digital textile printing. Mexar TEX3 has been developed for a number of different printheads, including Epson (DX4/5/7), Ricoh (Gen 4/5), Panasonic, Fujifilm Dimatix (Starfire 1024) and Kyocera (KJ4B). Mexar TEX3 is available in cyan, magenta, yellow, black (CMYK) and light colours as well as fluorescent pink and yellow. Mexar TEX3 has a very wide and vibrant colour gamut and achieves excellent printability even at high print speeds. The décor market is expected to transition over the next 3-5 years with a significant percentage of production moving to digital. Laminate papers, floor coverings, furniture and wall coverings are all areas for which Mexar has been developing inks for digital inkjet printing. Many of these inks are designed around the pigments used in the traditional gravure printing process, giving ease of introduction into existing processes. For more information on Mexar's developments, and to discuss your requirements, please contact us.